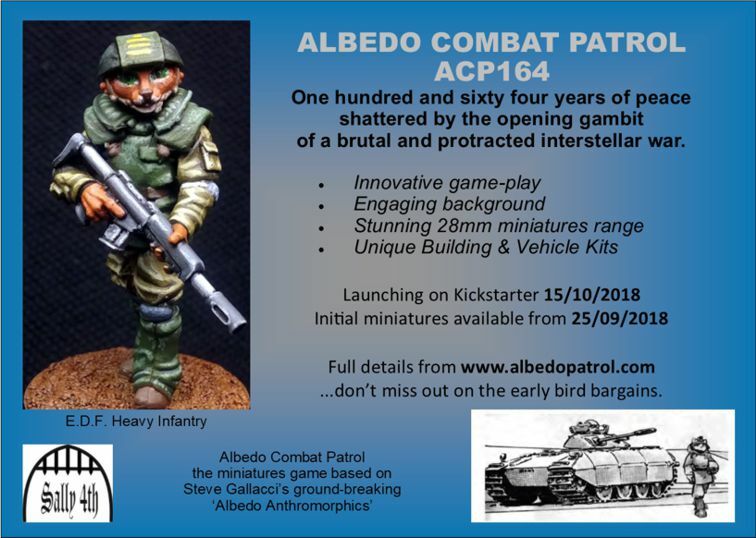 ACP164 is a 28mm miniatures game based on the ‘Albedo Anthropomorphics’ comic written by Steve Gallacci. The product line includes a campaign sourcebook, rules system, a miniatures range, vehicles, buildings and terrain items. Albedo is a hard science comic, featuring anthropomorphic animals or “critters” in a universe apparently created just for them. 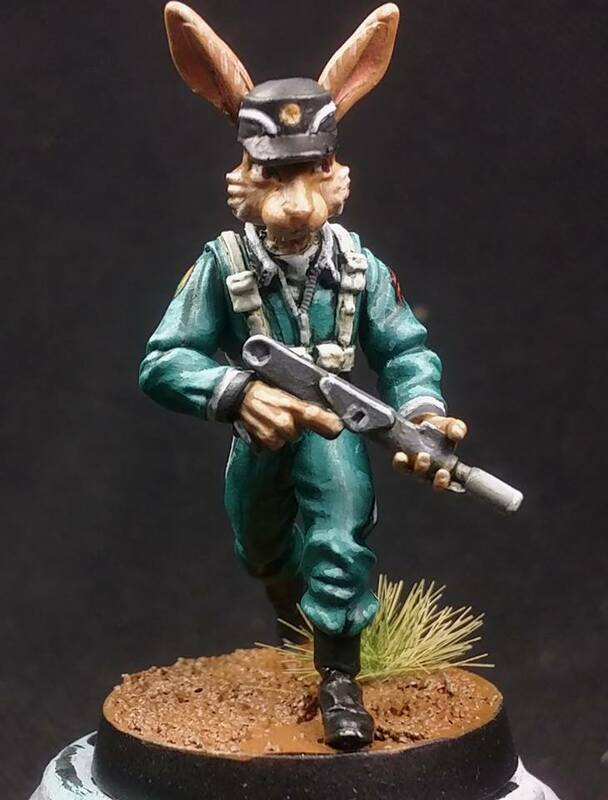 The opposing factions in this universe are the Independent Lapine Republic (ILR), which is a society dedicated to advancing the causes of Rabbits and crony-capitalism. They are engaged in a war of expansion against everyone else, which has forced the creation of the ConFed, or Confederation of Planets. The ConFed is represented in firefights by two different forces, the Home Guard, who maintain security on individual planets, and the Extra Planetary Defence Force, an elite force dedicated to defending systems and recapturing systems taken by the ILR. The Albedo rules system, Albedo Combat Patrol, has been written by John 'Buck' Surdu, retired US Army Colonel and prolific and innovative games designer whose previous works include Gaslight, Look Sarge No Charts, Fire Team Vietnam, Blood and Swash, Beer & Pretzels Skirmish and many, many more. The rules feature innovative, fast play card based combat mechanisms that bring out the detail of tactical ground based combat operations. 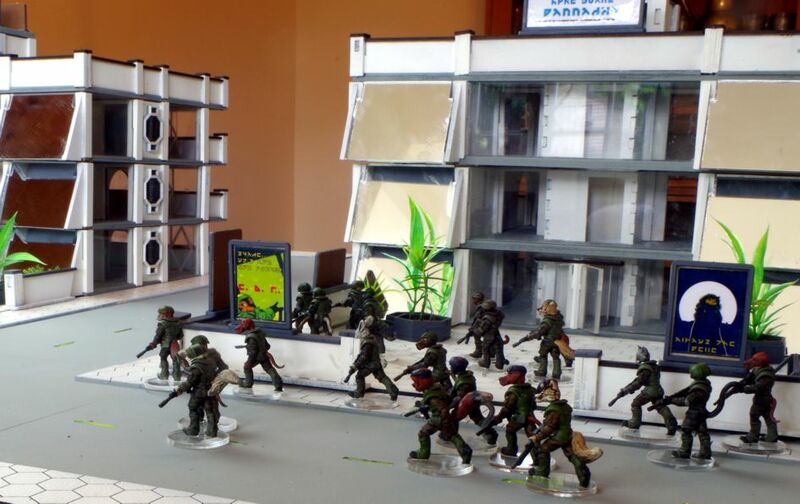 The miniature range has been digitally sculpted and the figures are supplied as multi-piece metal castings to allow a wide variety of troop type to be depicted. The miniatures have been designed to overcome many of the problems associated with multi-piece metal castings. Heads are cast with a neck that finishes in a pin that locates in a hole in the body; where possible pairs of arms are cast as a pair holding a weapon with pins at tops of arms that locate in to holes in shoulders. This ensures that components align perfectly and are easy to glue together. The Albedo comics feature a vast range of sapient mammals so using our multi-piece approach we hope to be able to make all species that appear in the comic available to gamers as miniatures. Sally 4th will be running a Kickstarter campaign between 15th October and 19th November to raise additional funding for the project, however we are adopting a slightly different approach, which we hope will benefit backers and customers. We have funded the Albedo project as far as we can with internal funding and now need the support of the gaming public to take the game to the next stage. The miniatures that we have already developed are going to be made available for purchase just before the Kickstarter launches. They will go on pre-order on 24th September. The reason that we are doing this is that as gamers we have backed many kickstarters over recent years and have been very excited during the kickstarter period and then frustrated by having to wait a year (or more) to actually play the game. Also, The Albedo Miniatures game is a new gaming concept. 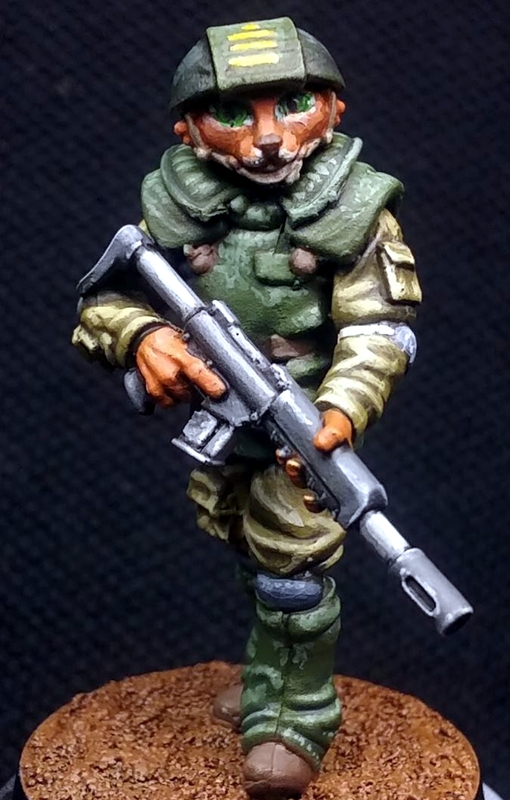 As far as we know there are no other ranges of anthropomorphic sci-fi miniatures available to use as proxies, and we want backers to be able to start playing and be able to participate in the play test of the rules, and also to experience the quality of the miniatures. A PDF copy of the introductory rules, cards and other player aids will be available to backers to download from 15th October. This entry was posted on Thursday, August 30th, 2018 at 19:19 and is filed under News. You can follow any responses to this entry through the RSS 2.0 feed. You can skip to the end and leave a response. Pinging is currently not allowed. Wow man, Albedo is a blast from the goddamn past. It’s one of the reasons I started drawing comics! I’ll have to keep an eye on this. I might be interested in using some of these as aliens or uplifts (if that’s the right word) in other sci-fi settings. Cat-humanoids in particular appeal to me. Haven’t heard of Albedo before but I might check it out now. Oh yes, I do remember this comic! Played in both a Traveller and Gamma World campaign that used it as the background. Some really cool designs in there. The Kickstarter went live a week ago, funded in first 13 hours and has unlocked the first five stretch goals.